THE 2017/18 NBA season is only three weeks old, but there have already been a number of high-profile uniform malfunctions. Now Nike, in the midst of its first year as the league’s official apparel provider, has promised to make necessary changes. With tweaked aesthetics and the introduction of jersey sponsorships, the uniforms have a different look from last year’s Adidas designs, but they come with one major downside: they rip easily. 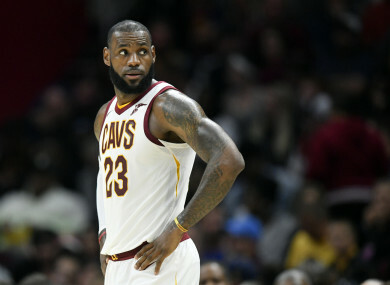 Since the start of the season, several players, including LeBron James, Ben Simmons, and Kevin Love, have seen their jerseys fall apart on them on game day. It was a welcome statement from the world’s largest apparel company. The tears have been bad enough on their own, but it hasn’t helped that they’ve affected some of the league’s biggest stars. Check out this clip of Ben Simmons losing his jersey while fighting for a rebound. Kevin Love wasn’t even in the game when it happened to him. The forward was walking towards the bench when he pulled his jersey over his head, causing it to tear. In all, at least five players have ripped their jerseys since Nike took over as the NBA’s uniform provider, including James, Simmons, Love, Draymond Green, and Tyler Ennis. Those five are all Nike spokesmen, creating an embarrassing footnote for the company. Email “Nike left red-faced and vow to change NBA jerseys after players suffer 'wardrobe malfunctions'”. Feedback on “Nike left red-faced and vow to change NBA jerseys after players suffer 'wardrobe malfunctions'”.